Private commercial banks (PCBs) have recorded 30-95 percent growth in operating profit in the six months to June 30, 2010 compared to the same period last year. The growth came mainly because of their trading in the stockmarket, while bankers said business and network expansions have also contributed to the staggering growth despite a sluggish investment demand. “The PCBs that have capital market operations generated a huge profit. The banks might have encashed their stocks,” said Helal Ahmed Chowdhury, managing director of Pubali Bank. Anis A Khan, managing director of Mutual Trust Bank, said a significant increase in the banks' business and volume had also helped the sector grow sharply. According to both the bankers, at least 30 percent of their business during the period came from the stockmarket operations. Statistics show Pubali's operating profit rose nearly 60 percent to Tk 285 crore during the first six months of this year compared to the same period last year. Social Investment Bank recorded Tk 105 crore operating profit, which was Tk 65 crore in the first half of 2009. Mutual Trust Bank's operating profit rose to nearly Tk 105 crore from Tk 67 crore last year, while Uttara Bank increased to Tk 150 crore from Tk 122 crore. Standard Bank's profit doubled to Tk 140. One of the largest and oldest PCBs -- AB Bank -- posted a huge profit at around Tk 350 crore in the six months this year, which was Tk 200 crore in the same period last year. Prime Bank logged Tk 335 crore, while the amount was Tk 255 crore last year. NCC's operating profit reached Tk 185 crore during the January-June period of this year, while that of Dutch-Bangla Bank nearly Tk 200 crore, Dhaka Bank 181 crore, Bank Asia Tk 215 crore, Southeast Tk 305 crore, National Bank Tk 305 crore, Mercantile Tk 230 crore, United Commercial Tk 226 crore and BASIC Tk 62 crore. 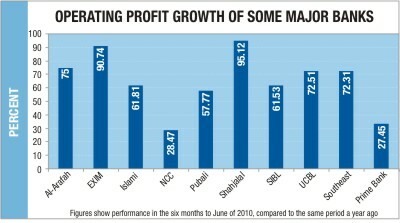 The Islamic banks have also posted a huge growth in their operating profit during the period. Al-Arafah's operating profit rose to Tk 140 crore this year from Tk 80 crore last year, while EXIM and Shahjalal banks' profit almost doubled to Tk 210 crore and 160 crore respectively during the first six months of this year compared to the same period last year. Islami Bank Bangladesh logged Tk 500 crore in operating profit during January-June of 2010, up from Tk 309 crore in the same period last year. “Our overall business growth was pretty good during the period,” said Kaiser A Chowdhury, managing director of AB Bank. “The banks' profit taking by selling their stocks has pushed up their profit,” said Helal Ahmed Chowdhury of Pubali Bank. The banks are forming their merchant banking wings as a subsidiary company in line with a directive of the regulator, Bangladesh Bank. The banks that have merchant banking operations have to make a subsidiary company by October this year. Recently, the central bank has also ordered the banks not to invest more than 10 percent of their liabilities in the stocks. “All these things have forced the banks to sell their stocks that have fuelled profit,” said Chowdhury. Shahjahan Bhuiyan, managing director of United Commercial Bank, also credited the banks' swelling growth to their operations in the capital market. “Also, a rise in our lending, a reduction in classified loans and high-cost deposits have contributed to our business growth,” said Bhuiyan. Bank kena na thakle akhon kena ki thik hobe? Jodi hoi tahole kon bank? Sob kenar samortho to nei. Hisheb kore dekhen kontare EPS shochey valo ashe oita kine felen.